Phase 6 teaches you how to fire projectiles, and make a UI & Sound fx to accompany the mechanic. point at which we want these shells to be created. and we put that in front of the barrel of the gun. force you're putting in to a shot. First thing is to select our tank. ways to do anything in Unity. Making a new object is yet another one of those. you can right click on existing game objects. and I go to Create Empty. and then rotate it the right way. and then the rotation is (350, 0, 0). so I'm just going to switch there. So position (0, 1,7, 1.35). So just to unobstruct that a little bit. left or right so the exposition is of course going to be 0. Because the barrel is in the middle of the tank. 1.7 up in the Y axis. forward in the Z axis. So if you've done it right it should look something like this. intersect the collider and detonate straight away. So we're going to right click on our canvas now. and then right click, we're going to create a UI slider. a new canvas, we can use the same one that we've got. So I'm just going to zoom out and show you what this looks like. Yet again it's our old friend the slider. Not aware of what we want to do with it at all. strip that's going to exist in front of the tank. the amount to which the arrow is shown. to expand everything at once. it's just based on the Fire button in the game. delete it, therefore deleting the handle as well. So command-backspace on mac, delete on pc. emerge as soon as they start firing. So I'm going to select the background. and many things within it. with our world UI that we're doing. Handle Slide Area game objects. Then we need to make this not intractable. with a mouse or anything like that. and look at the Slider component in the inspector on the right. being furthest away from the tank. we'll say is 'Bottom to Top'. values from 15 to 30. And we can leave our Minimum Value at 15.
and you'll see that once we start doing it. the position for it, which you'll see shortly. So the parent of this slider is the canvas. to where you want them to be. So that's exactly what we're going to do right now. the AimSlider and the Fill Area, just those two. yet again we have these anchor presets. time using alt, which is exactly what we'll do. tap alt now we are stretching and positioning. place now and it's now based under our tank. if I haven't already so I can see the fill. got a gradient fade to the bottom of it. just to show you that really quick. to be sliced and stretched. this small space in which we can stretch. we're going to setup it's visual area. to remove this value of 10 from the Height. zero that out totally, set the height to 0.
there's also the actual image itself. So you'll see an image component. it currently has this default UI sprite thing we don't want. Click on Aim Arrow there. we haven't quite finished it. remember alt-click to stretch them out. to remove any offset from the parent Rect. used circle select to choose the Aim Arrow. so the 5th one at the top here. then that's how you can just switch between those tools. So the fifth one there is the tool you want. and allow you to drag things out. to orbit around what you're looking at. So if I alt and then drag around I can see what I'm doing. change in to a totally flat view overhead. and I'll show you it quickly and then we'll go back through it. so that they're roughly on the edge of the tank. snapped on the front of the tank. an orthographic isometric view right now. in the Z axis just to bring the up a little bit. So it's just slightly off the ground, like that. run that by you again. got the Aim Slider selected. Drag in the left and right edges. function the same as everybody else's game. end up with something that looks like this. Of course save your scene throughout. Just to make sure you're up to date. I'll give you those values now. our values would be 1, -9, -1, 1 and 3. So remember this is the Aim Slider, 1, -9, -1, 1, 3.
that my arrow is doing what it should do. So you can test it out that way. once you've tested it out. if you pop that open you'll find something called Tank. 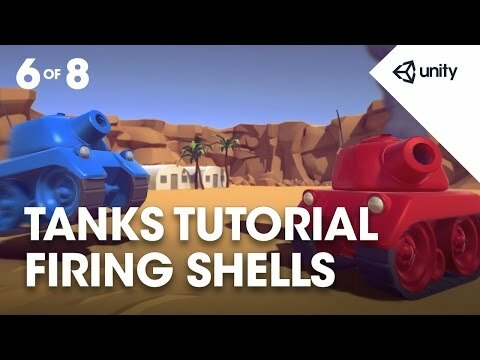 drag and drop that on to the Tank game object. and drop it on to the Tank. other components so that you can see it more easily now. there and we're ready to start editing it. we are ready to edit. Yeah, let's do that first. Okay, so that's all the comments done. and find out what they mean. So that's why we need that. so we've got that rigidbody Shell there. about that rigidbody we can just refer to that as the prefab. so that's what that references there. to make it grow and shrink. So that's what that audio source is there for. one for actually firing it. And so now we've got a few float variables. were 15 for minimum and 30 for maximum? we're doing 15 to 30 for the LaunchForce. here and on the slider. Let them discover it on their own! we've found these to be good values for now. to the maximum launch force? takes about 3/4 of a second. we're going to calculate how fast that needs to go. which we'll store based on the PlayerNumber. how much have we built up so far. And the last one is whether or not we've fired yet. we want to do it once per button press. and we're setting the AimSlider's value back to the minimum. Then we've got the Start function. equal to the string Fire plus a number based on the PlayerNumber. So Fire1for Player1, Fire2 for Player2, etcetera. which gives us, in this instance, the spacebar. and the time we've got to do that is the ChargeTime. over the time, that's how we're calculating that. So next we've got the Update function. maximum and then you need to fire. invisible at it's most minimum value. to be at a different value we can set it then. and go through what we actually need to do in those cases. in or not, it's up to you. So at the maximum amount of charge but not yet fired. So you get ButtonDown is when it's first pressed. check is the Fire button, so m_FireButton. and then not fired it, so we need to check for that. is, you might have guessed it, if you've released the button. and again we need to check that we've not yet fired. of course we haven't fired, we've just pressed the button. actually need to do then. and we've not yet fired. we want to do it at the maximum. which we'll write in a little bit. then we know that we have not yet fired. So m_Fired is false, we've not fired yet. that the LaunchForce should be at it's minimum. So we'll set CurrentLaunchForce equal to MinLaunchForce. update how much the charge has gained. CurrentLaunchForce to itself plus ChargeSpeed times delta time. 'add this to it's current value'. It's saying 'set this to itself plus a little bit extra'. element of it by setting the slider's value. is if you've released the button you fire, that's it! So we'll just quickly go over that. only change the AimSlider based on the button being held. we'll set it back to the maximum and then fire based on that. then we have not yet fired, so fire gets set to False. And then CurrentLaunchForce gets set back to our minimum. We also play the correct clip for that situation. by the ChargeSpeed multiplied by Time.deltaTime. And we will set the AimSlider's value appropriately. Finally, if we've released the button then we'll fire. Why don't you set any other audio conditions? effectively with the sound of it firing. the rest of the audio in that scenario. Okay, so let's move on to the Fire function. based on how much we've charged up. of course Fired = True. above that we've just put in. but we're going to use it's return type. So that's the last parameter that we've got there. an object, it doesn't return a rigidbody naturally. what we do is we say as Rigidbody at the end. 'I've created an object, can I treat this as a rigidbody? so yes, and I'll return that'. and a magnitude, which is the CurrentLaunchForce. with an amount equal to the CurrentLaunchForce. audio that's playing as we were just mentioning earlier. So ShootingAudio.Clip gets set to the fireClip. And that will automatically stop the audio source from playing. So we need to play the audio source with the new clip. the console for any errors that you might have. Let's hope that I got it right! assigned those public variables that we need to. and drop it on to where it says Non (Rigidbody). That will assign it there. Drag and drop that on. the AimSlider is the game object to assign there. And then Shooting Audio is the slightly trickier one. drop it on to the variable Shooting Audio. So grab the component name, drop it on there. to just switch to assigning something else. I'm just going to select that and ShotFiring for the second one. So it should be assigned and it should look like that. prefab version that's saved in the project. is the finished version that we've made so far. they should all be in blue right now. So Apply with the tank selected. Okay, so the tank is now finished. But we don't want it to stay in the scene. So I'm just going to hit Play. I'm just going to turn my volume down, or off. how it's meant to sound like. as death lotus, this move. But once you've done that the tank is complete. to be used by the game manager. make sure you've updated, saved your prefab. or delete on PC, save your scene once you've got rid of your tank. public int m_PlayerNumber = 1;              // Used to identify the different players. public Rigidbody m_Shell;                   // Prefab of the shell. public Transform m_FireTransform;           // A child of the tank where the shells are spawned. public Slider m_AimSlider;                  // A child of the tank that displays the current launch force. public AudioSource m_ShootingAudio;         // Reference to the audio source used to play the shooting audio. NB: different to the movement audio source. public AudioClip m_ChargingClip;            // Audio that plays when each shot is charging up. public AudioClip m_FireClip;                // Audio that plays when each shot is fired. public float m_MinLaunchForce = 15f;        // The force given to the shell if the fire button is not held. public float m_MaxLaunchForce = 30f;        // The force given to the shell if the fire button is held for the max charge time. public float m_MaxChargeTime = 0.75f;       // How long the shell can charge for before it is fired at max force. private string m_FireButton;                // The input axis that is used for launching shells. private float m_CurrentLaunchForce;         // The force that will be given to the shell when the fire button is released. private float m_ChargeSpeed;                // How fast the launch force increases, based on the max charge time. private bool m_Fired;                       // Whether or not the shell has been launched with this button press. // The fire axis is based on the player number. // The rate that the launch force charges up is the range of possible forces by the max charge time. // The slider should have a default value of the minimum launch force. // ... use the max force and launch the shell. // ... reset the fired flag and reset the launch force. // Change the clip to the charging clip and start it playing. // Increment the launch force and update the slider. // ... launch the shell. // Set the fired flag so only Fire is only called once. // Create an instance of the shell and store a reference to it's rigidbody. // Set the shell's velocity to the launch force in the fire position's forward direction. // Change the clip to the firing clip and play it. // Reset the launch force. This is a precaution in case of missing button events.